One of the most interesting parts of our trip to Italy was our visit to the remains of the once vibrant Roman city of Pompeii. It felt as if we had entered a time vortex and were suddenly in an ancient city that had been preserved exactly as it was 2,000 years ago. 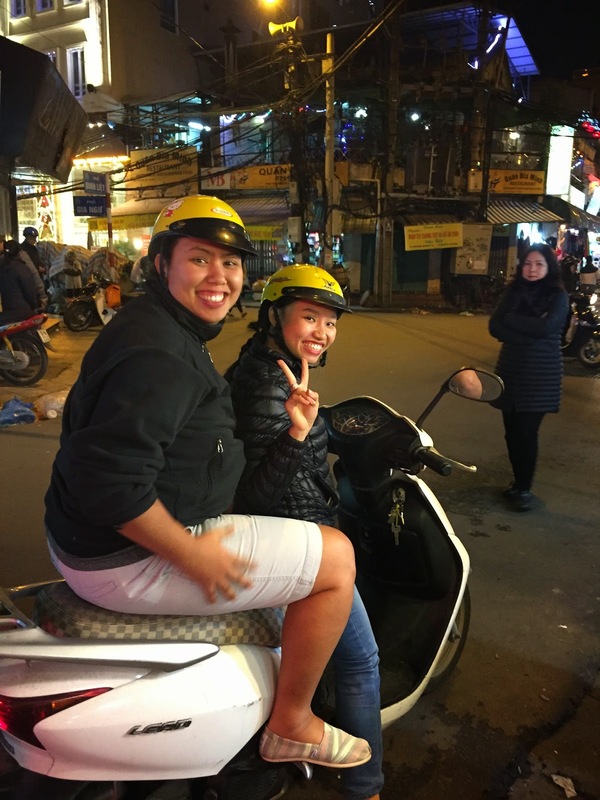 It was our mission to explore the exotic remains of the city and its inhabitants over the next few hours. 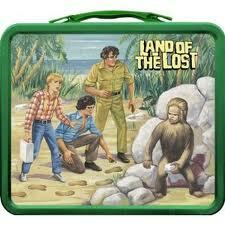 It felt like watching an episode of Land of the Lost as a kid. buried Pompeii (from BBC's Pompeii: The Last Day). 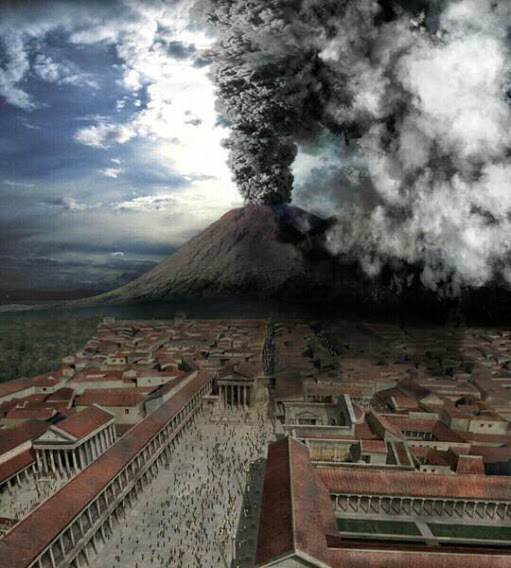 On a fateful summer day in A.D. 79 Mount Vesuvius erupted catching the nearly 20,000 inhabitants of nearby Pompeii completely off guard. 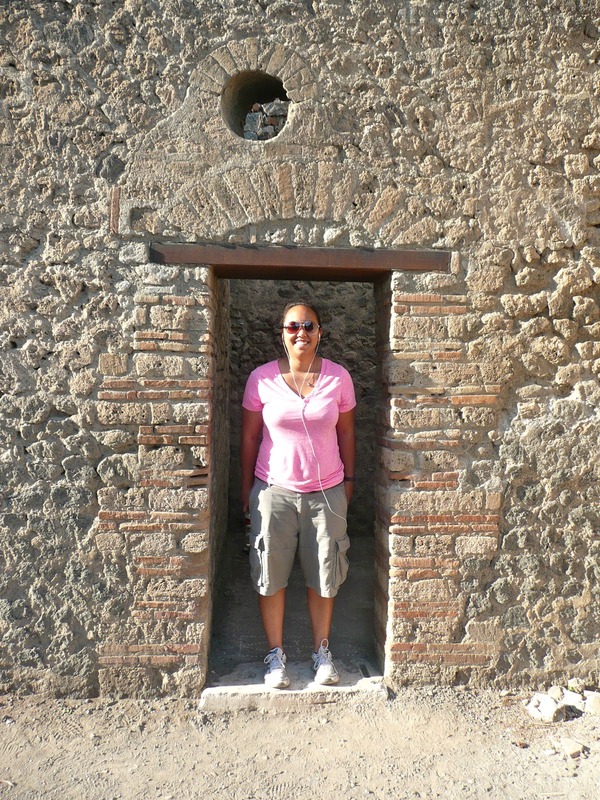 They had no idea they were living so close to a volcano as it had not erupted for over a 1,000 years. Some residents chose to quickly abandon their homes and flee to safety. Others made a less wise decision and chose to remain in the city. They unfortunately did not survive as the city was buried in thirty feet of ash and rock. The still active volcano, (last eruption was in 1944) eerily looms today in the background behind the once vibrant Roman city. The eruption, although a terrible disaster, also had a silver lining. It preserved the buildings, frescos painted on the walls, tools and even bodies frozen in time. Thus, giving the modern world a window into what ancient Roman life was like. 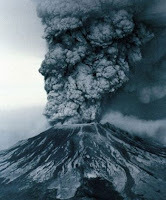 The Pompeii eruption is similar to a modern-day eruption, that of Mount St Helen's here in Washington state on May 18th, 1980. When this volcano erupted, it spewed ash hundreds of miles away. Several residents living close to the volcano (although they had been warned the volcano was going to erupt) chose not to leave their homes by the mountain and they eventually were killed by the eruption. FloJo remembers her aunt Callie sending her family a mason jar full of that volcanic ash, which she took to show and tell at school. 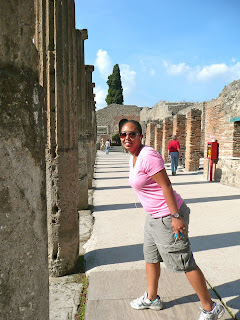 Back in Pompeii, Italy, we had somehow managed to not get a map when we paid our admission fee. Luckily we had downloaded the Rick Steves audio guide before our visit. 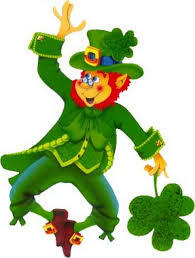 We used his audio to help us know where we were, what we were seeing with color commentary and where we should go next. TIP: learn from our mistake and make sure to get a map (the visual would help navigation through the city immensely). Also, the Rick Steves audio guide is free and we highly recommend downloading this ahead of your visit. 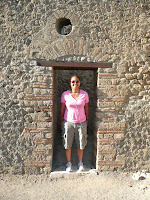 We entered through what used to be the gladiator training grounds and their barracks. We started our exploration at the theatre. In true Roman form there were different pricing tiers. The white marble seats up close were the premium seats, there was a main section and like in our stadiums and theaters today, the cheap seats in the nosebleed section. The theatre was large enough to accommodate 5,000 guests. We left the theatre and followed the city street that led to the main town square known as the Forum. The Forum was where the residents went to worship, do their shopping and socializing as well as where the government offices were located. The streets alone had a story and were fascinating to look at. 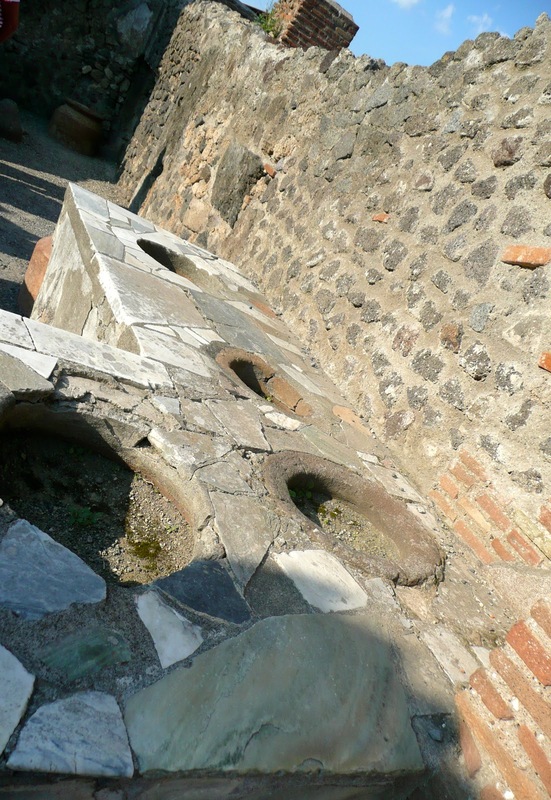 We could see grooves created by chariot wheels that had worn them into the streets of Pompeii similar to what large semi-trucks do to our interstate highways today. 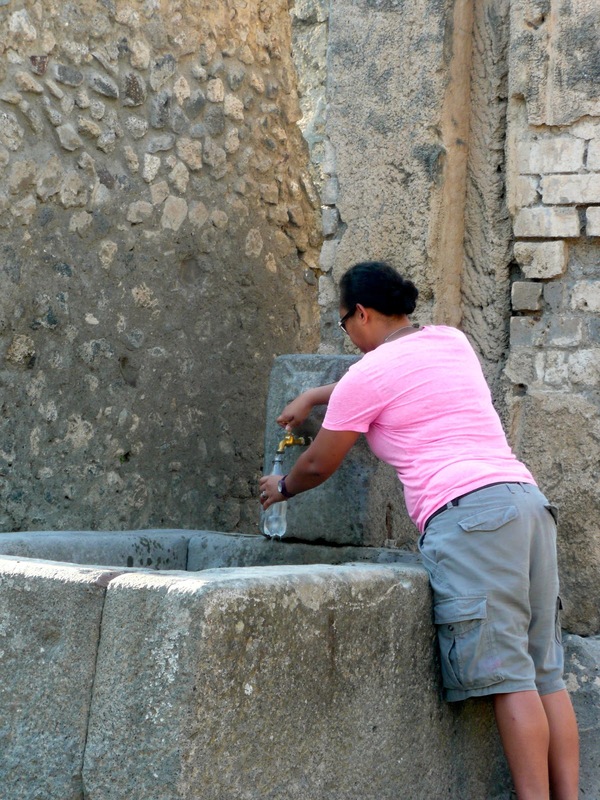 The city work crews would flood the streets each day with sea water to keep the city clean (we have to give the Pompeiians credit for this). Some clever engineer built three stepping stones across the street so towns people could cross the street without getting their sandal clad feet wet. The Temple of Jupiter located on the North side of the Forum was the religious center of the city. The Temple of Jupiter has little remaining these days besides some ruined columns on top of a base with stairs leading up to it. 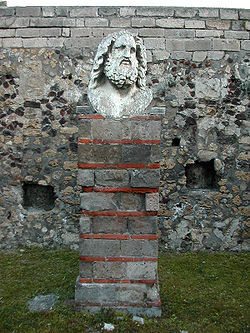 There is also a small, white marble head which represents Jupiter. 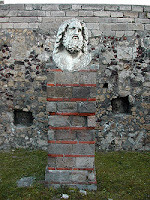 It was not uncommon for cities of Roman rule to build a temple honoring Jupiter, the most important God in ancient Rome. The Temple of Vaspian has a white altar that remains and a raised pedestal behind it that probably would have housed a statue of the deity the temple was built for. 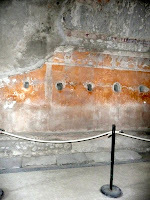 The Curia was Pompeii's city hall. It was built out of brick with a marble facade. 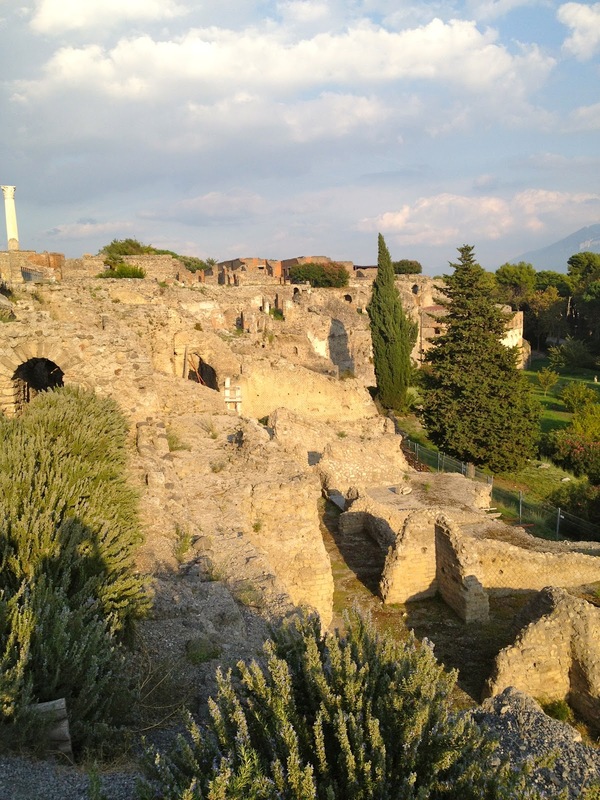 As you face Vesuvius it's on the left side of the Forum. This is the building where elected representatives came to vote and conduct their political business. The basilica, also on the left, was the city's courthouse. The word was originally used to describe a Roman public building, usually located in the forum of a Roman town. By extension it was applied to Christian buildings of the same form and continues to be used in an architectural sense to describe those buildings with a central nave and aisles. It's outlined now by column stumps. 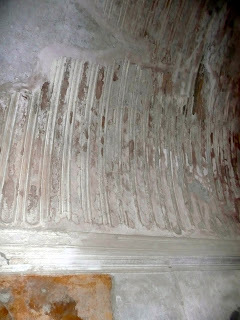 There is still some remaining evidence that marble used to line the walls, indicating the importance of this building. On the right hand side of the Forum is the marketplace. This was the center of economic trading for the city. Archeologists have found clues to ancient Roman food, everyday tools and banking from remains found here. 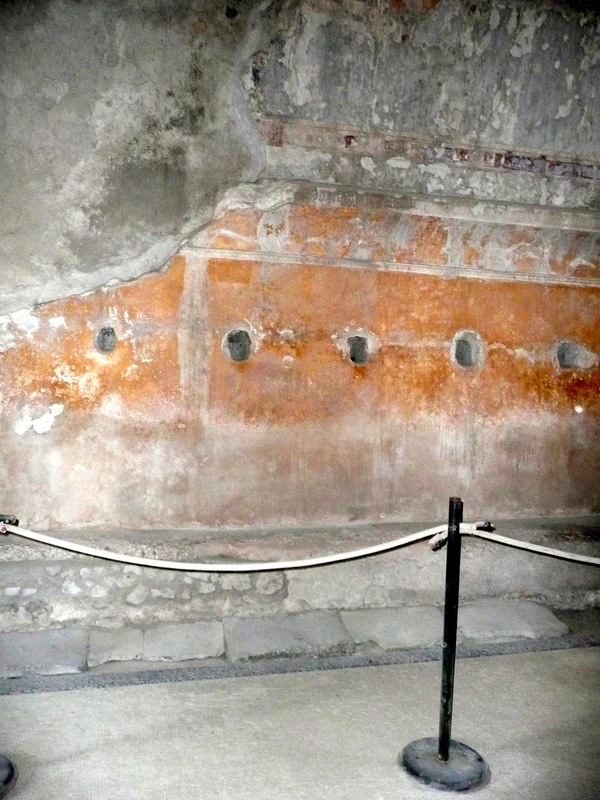 There are also a few fairly well preserved frescos on one wall. Housed within the marketplace, lest those visiting forget the 2,000 citizens that died being buried under the ash, there are two glass cases holding the casts of two of those that perished that day. Although very creepy to look at, it's also a preservation miracle. A modern archaeologist detected hollow spaces underfoot created when victims' bodies decomposed. 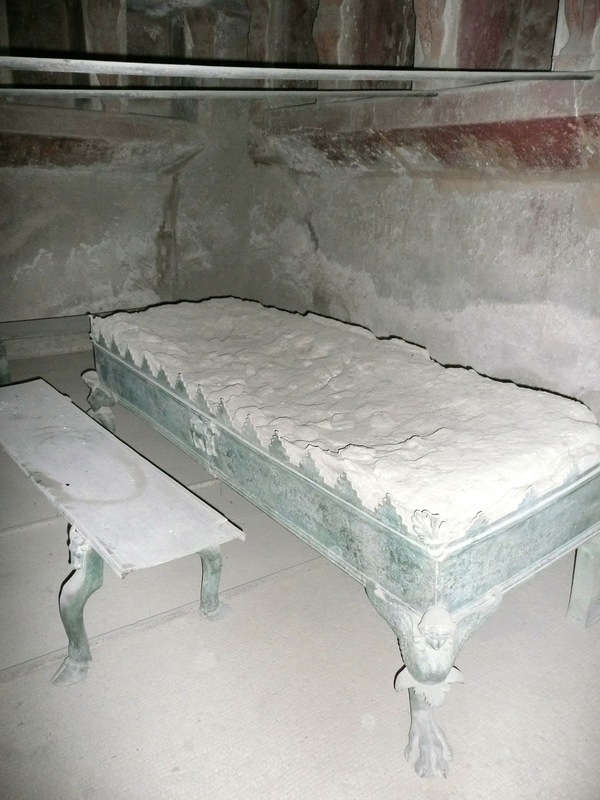 The archaeologist had the ingenious idea to fill the spaces with plaster and was able to create these molds of several Pompeiians who were buried in the ash that fateful day. 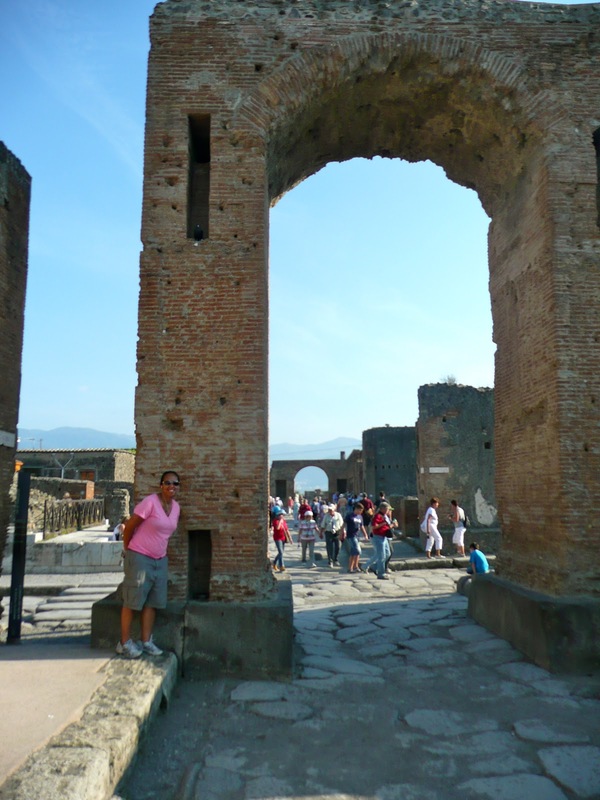 After leaving the marketplace we headed to one of Pompeii's six public bath houses. Only the rich were able to afford privately built rooms with this function. 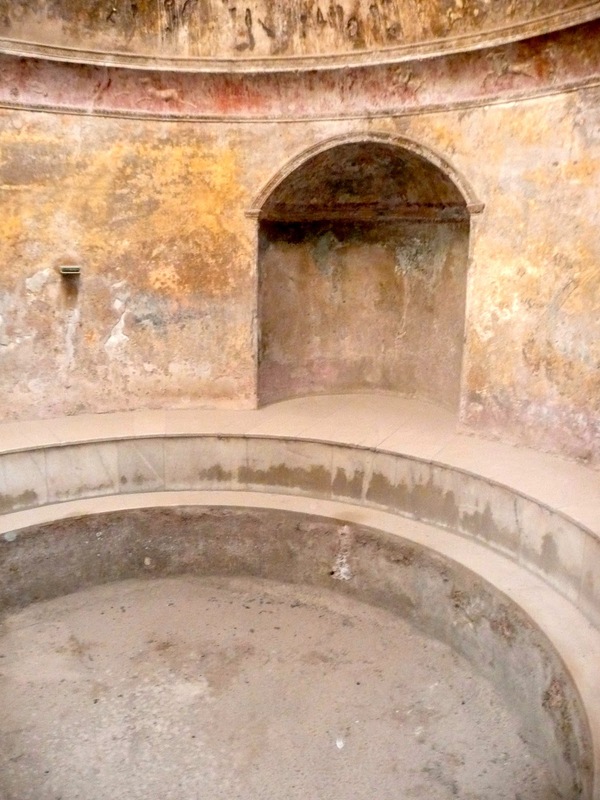 These baths were divided into a men's and women's zone. 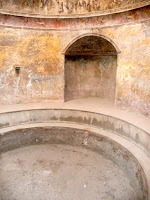 Once we entered we could easily imagine what a Roman spa day was like. The rooms were surrounded with preserved art and tile on the walls. They took full advantage of the Roman ingenuity and used a system of aqueducts engineered to pump water into huge caldrons that were either hot, warm or cold. Massages were also given here along with a gymnasium for working out (had to keep those gladiators ). 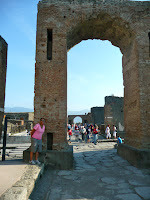 Exiting the baths we crossed the street to what used to be Pompeii's version of McDonald's. Like today, many ancients preferred to dine out rather than cooking at home. Again, we had to admire the intelligence of these early business people knowing that once you hit the spa no one wants to go home and slave over a fire. What's left are long marble counters with holes in them that held pots full of their food products. The House of the Tragic Poet is just a few steps away and gave us a giggle. The owners had created what may be one of the first documented "Beware of Dog" signs ever. The mosaic is placed squarely in the entryway and is a clear message to people passing by. Speaking of dogs there were several stray dogs wandering around the ruins. Like most strays they were thin and not very clean and appeared to live off the generosity of tourists. 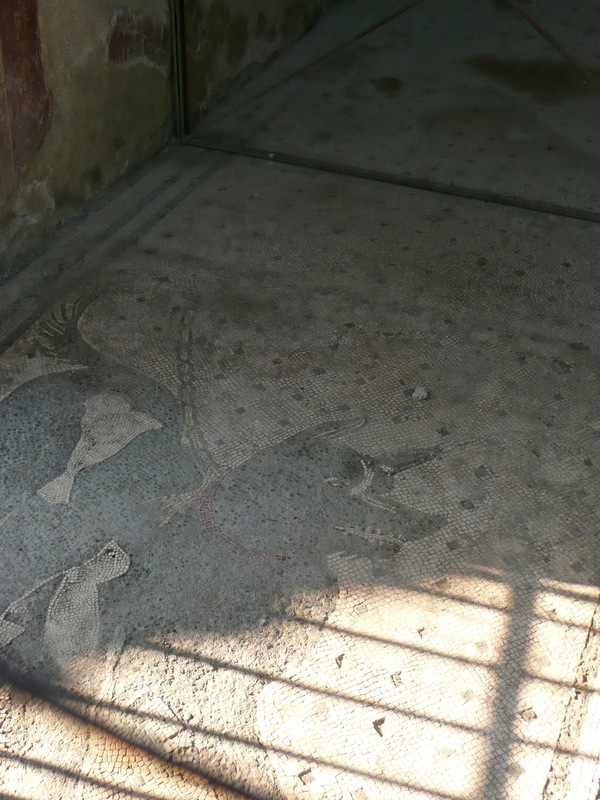 However, we learned that the tour guides of Pompeii actually have taken responsibility for the dog's care. They pool tip money to pay for proper food and care for these dogs. Very cool! Slightly downhill from the fast-food joint was this aqueduct arch which was part of the water delivery system for the city of Pompeii. 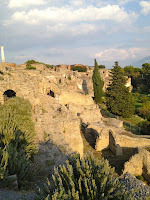 We continued downhill to see Pompeii's largest home, the House of the Faun. You know every town has one of these homes that the residents just love to take a stroll by and dream about someday owning something similar. The home has a small bronze statue known as the Dancing Faun. The home itself is believed to have had approximately 27,000 square feet (an entire city block) with about 40 rooms. There are beautiful floor mosaics inside the home. There were more than 40 bakeries in the city. We stumbled upon several of them as we meandered through the the various neighborhoods. One was a bakery and mill with a brick oven that was pretty much the same as our modern day pizza ovens. We learned on Rick's audio commentary that the huge column stones were actually what they used to grind flour. The grain was put into the top and then mules or slaves would push wooden handles that were put in the holes in the side that turned the stones and ground the grain into flour. 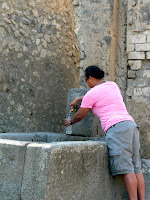 The hardest thing to find and the business Ro was most intent on finding was one of the thirty brothels in Pompeii. We finally came upon it after squeezing through a modern chain link fence that said we were not supposed to go any farther. We had not come this far however, to be denied seeing the true epicenter of the city. The brothel itself consisted of a few tiny rooms that had very hard and uncomfortable looking beds made of stone in them. Perhaps the intent was so the customers didn't get too comfortable. 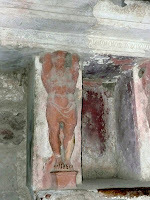 In the first pass, we missed the naughty frescoes that were preserved on the walls and ceilings of the brothel. But, upon the second pass through Ro caught site of one of them. One more example of not much changing between then and now. It was amazing how we literally stepped back to 79 AD and could easily envision what life must have been like back then. Surprisingly, these ancient lives didn't seem that different from ours, minus modern technology. Our visit to Pompeii provided us with an intimate connection with these Pompeiians who died during the eruption. The day trip from Rome is one we highly recommend as it provides a poignant link from past to present. Wikipedia, Basilica, 1st paragraph, retrieved from here.